Thanks for stopping by STLBlues! I'm Dave - nicknamed Big Dave - as everyone at STLBlues felt a nickname was mandatory for a Blues publisher. I serve as the publisher of STLBlues. The driving force behind this has always been my love of the Blues. What began as a hobby has evolved into a leading 'Music Destination' site, and millions of visitors. "To the gregarious, hard-working, fantastic soul behind the Live Music Calendar...we would like to say thank you so much for the opportunities and support you have provided. We are most appreciative." "Thanks STLBlues, you are a jewel...this is the biggest crowd we have ever had!!" ”We cannot thank you enough for positioning the festival in your website listing service for the Greater St. Louis Jazz Festival! This is exactly the kind of support the festival needs to succeed." "It is so easy to use and I love having control over the calendar, with last minute gig changes this is awesome!!" Along came the Street Team, helping grow STLBlues into what it is today. In 2008, STLBlues was awarded the Keeping the Blues Alive Award - Internet by the Blues Foundation in Memphis, Tn. That's the highest honor the Blues World can give a website! We owe it all to the bands for keeping the music alive, and to you, the music fans, for supporting live music and stopping by our Live Music Calendar! "It's been quite a path for STLBlues." My involvement in the St. Louis Blues scene began very indirectly back in 1993, when I was asked to provide a First Aid team for the Blues Heritage Festival. Seemed the Red Cross had to withdraw, as they were quite busy with the Great Flood of 1993. Being a career firefighter/paramedic here, I just called upon some Blues lovin' friends in the medical field, and soon had doctors, nurses and paramedics volunteering for the Fest. I met lots of the local bands along the way, and also the organizers of the Fest at that time - the St. Louis Blues Society! Along the way, as I delved more deeply into the Blues, my appreciation for this American art form, and the American history wrapped throughout, kept growing. 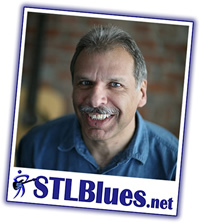 Gradually my involvement in the Blues led to 5 years as a writer for the Bluesletter, the magazine of the St. Louis Blues Society, and as a Board member for the 1997 St. Louis Blues Heritage Festival! Fast forward - the National Blues Museum project came along in 2010, an effort I am thrilled to be involved in, to this day! STLBlues has gained an international audience along the way! We're growing every day, as more artists & venues join the calendar, driving the live music of this Music City! Keep on coming back, our 'Mission Statement' is to always bring you the best in BluesJazzRockSoulRnB 24/7!